With expansive views of the hinterland and the ocean, this elevated master built home is located on one of Byron Bay's most sought after streets. The home features an in ground swimming pool. 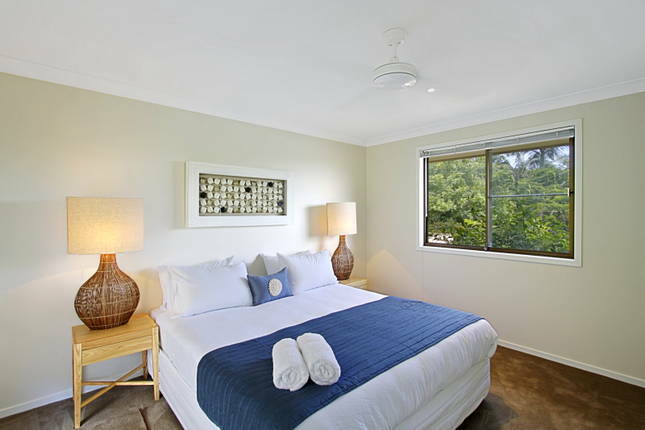 The house is only 350 metres to Clarke's beach and directly opposite the iconic Top Shop cafe so you can enjoy your holiday without needing a car, as all the main attractions of Byron Bay are only a short walking distance away. The home is child friendly with a fully fenced garden and child locking gate on the stairs. The open plan living spaces create an ideal area for entertaining, cooking and spending quality time with your friends and family. The fully equipped modern kitchen has all the necessities you need to keep everyone happy. This house consists of 4 bedrooms and lounge room downstairs accommodating up to 10 people with 3 bathrooms. The master bedroom has a king bed and ensuite with spa that faces incredible views of the mountains and hinterland. The second master bedroom also has a king bed with a lovely garden view. The third bedroom has 2 king singles which can be made up as another king bed and the fourth bedroom has 1 single bed. Clarkes Beach is situated an easy 10 minute walk to Byron’s town centre and the relaxed shopping and restaurant precinct of Byron Bay. You can take a leisurely walk along the sand, only minutes from your holiday accommodation, or choose the picturesque path that runs along Lawson Street, adjacent to the popular Main Beach. The Pass at Clarkes, provides a world famous surfing experience. Away on Messinger is a 5 min walk to Clarkes Beach and 10 mins to town centre.